Airbnb, a company that considers everyone’s home to be part of one big hotel, recently decided it might be a good idea to bring cultural heritage sites into its real estate portfolio. But a special offer to spend a night on the Great Wall of China has been canceled after complaints on social media. The planned stay on the centuries-old fortification that stretches thousands of miles was part of a contest series Airbnb has been running called “Night At.” A one night stay is offered in various exotic locations around the world to a few lucky winners. In this case, users were asked to write a short response to the questions: “Why is it more important now than ever to break down barriers between cultures? How would you want to build new connections?” Eight essays would be chosen as the winners and the prize would be a one night stay in a customized guard tower, a multi-course gourmet dinner, and traditional Chinese entertainment. Promotional photo depicting the remodeled guard tower an Airbnb guest would sleep in. Chinese state media reported on Tuesday that the cultural commission that oversees the Great Wall had released a statement saying “it was not aware of the event and no approval had been given.” But Airbnb claimed in its release that “there was an agreement in place that was the basis for the announcement of this event.” We’ve reached out to the company to ask what party it had made an agreement with but we did not receive an immediate reply. 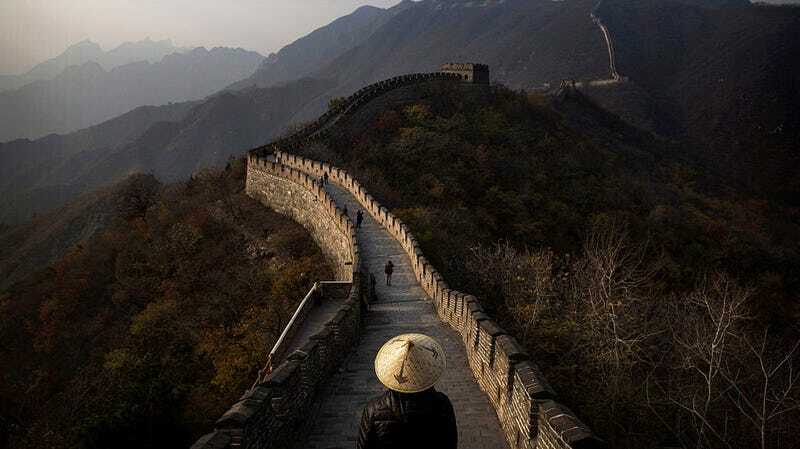 The South China Morning Post claims that a partnership was arranged with the state-owned Beijing Badaling Tourism Company, based on remarks by a cultural commission official. The idea of staying on the Great Wall overnight isn’t something that’s unprecedented; tourists are allowed to camp out if they like. But that’s a bit different than having a special-built suite inside a guard tower along with an entourage of chefs and entertainers. The fact that Airbnb has bent over backward to spin this as a high-concept meditation on crossing cultural barriers rather than a basic publicity stunt is a pretty good indication that organizers knew they were straddling a thin line. It’s akin to a Chinese company offering lodging on top of Washington’s Mount Rushmore head with complimentary hot dogs and a jug band. China is an important market for Airbnb. The company took on a Chinese name last year and has seen its bookings more than double. The lax regulatory environment is a dream come true for a disruptive corporation used to fighting angry hotel owners and authorities who say it raises rents and exasperates gentrification. But local competition from new entrants in the market like Tujia and Xiaozhu ensures that the future won’t be easy, and it certainly doesn’t want to piss off authorities. Previous contests in the “Night At” series have included stays in Dracula’s Castle and the Paris Catacombs. Following this debacle, it might want to stick with offerings like a night in Taco Bell—no culture claims that location with pride.